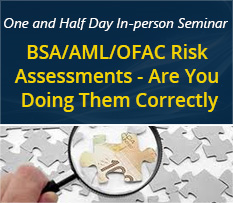 ComplianceOnline, the leading governance, risk and compliance advisory network with over 500 experts in various regulatory subjects, today announced a seminar on BSA/AML/OFAC Risk Assessments - Are You Doing Them Correctly. The one and a half day seminar led by renowned BSA expert Gina J. Lowdermilk will be held on February 11th and 12th, 2016 in San Diego, California. This Bank Secrecy Act risk assessment seminar will highlight BSA best practices that are acknowledged and recognized by regulators and examiners and will discuss each risk assessment area. Seminar instructor Gina Lowdermilk, PhD (ABD), CAMS, CRMS is a highly experienced and educated BSA/AML and financial regulatory compliance professional with extensive experience in policy and procedure development and implementation. Her emphasis has been working with financial institutions that are experiencing regulatory concerns and resolutions. Her 15 years of experience has given her the opportunity to work from small community banks to large, international financial institutions. During the workshop, the instructor will discuss how to conduct a comprehensive review of your organization’s BSA/AML/OFAC risk assessment and illustrate how to perform the risk assessments. Seminar participants will also comprehend the nuances of effectively implementing a BSA/AML/OFAC risk assessment program within your organization.